Foxi was born 2/22/2005, she was sired by KAP Johnny B Good with the dam TC MS Mountain 0001. She is a great mother to her calves! Foxi has a great build and has an easy temperament with just a tiny bit of stubbornness mixed in. She has beautiful calves. 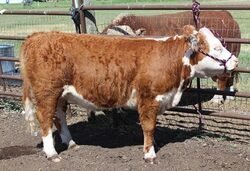 Hottie is a registered miniature Hereford. 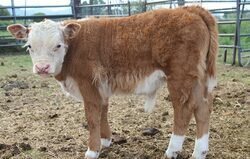 Born 02/03/2013 sired by KAP King Henry Hunter with dam KAP Gentle Utica. She has show wonderful show potential. She is due to be show and the NILE in October. Jazz is a registered miniature Hereford. Born 04/11/2013 sired by DF Sullivan Pride with dam Judkens baby gale. She has show wonderful show potential. She is due to be show and the NILE in October. Tike was born 4/10/2005. 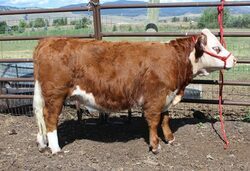 He has been shown at Western Montana Fair and the California State Fair. He has won champion and best in class at several shows. He has great build and loves to get attention. Tike is also the father to Martha. Tike enjoys being the main bull to our herd and constantly pampers his ladies. JK Mr. Heartbreaker was born 05/23/2012. 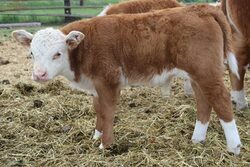 He is a registered miniature hereford bull. Heartbreaker was sired by Kap Playmate Tike with dam LH Missy. 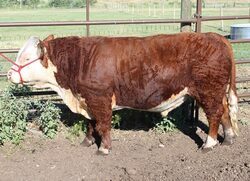 Heartbreaker has a great build and will be a show winner once he starts attending shows this summer. JK's SSR/KAP SAMSON was born 03/21/2014. 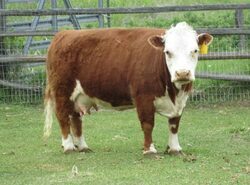 He is a registered miniature Hereford bull. Samson was sired by Libery's Simon with Dam RR Martha Tikette. Samson has great show qualities and will be shown at the NILE in October. 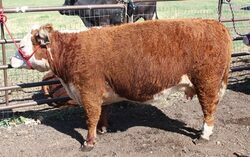 Cash is a full blood Miniature Hereford. Born 4/28/2014. Sired by JK Mr. Heartbreaker with dam JK Martha's Millie. 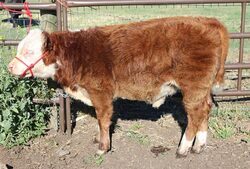 Harley is a full blood miniature Hereford. Born 4/10/2014. Sired by KAP Playmate Tike with dam Liberty's Missy.